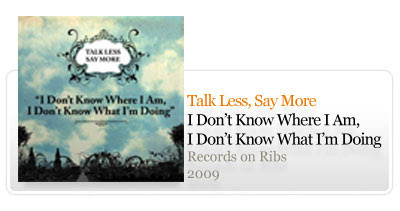 Mais uma netlabel descoberta, desta feita chama-se Records on Ribs e uma das suas edições mais recentes é este album Talk Less, Say More - I Don’t Know Where I Am, I Don’t Know What I’m Doing. "The companion piece to last year’s critically acclaimed Go Lucky, IDKWIAIDKWID is an excellent record its own right. Take the opener ‘You Were Right About Me’. Jell’s hasn’t written a better pop song: a propulsive, catchy electro number, nintendo beeps and surprisingly, Earth inspired slow guitar. See also Baby Animal’s dark but fond ballad or Still As A Rivers reflective ascending guitar figure. Will You Be Me Widow?, a story of trenches and doomed love, is backed by gracious 80s atmospherics. This would have been a tragedy left on the cutting room floor. The remixes here are excellent, shading songs anew. Pebbles In A Flood highlights Sensations Spring’s ‘innocent like pebbles in a flood’ to evocative effect, the Topaz mix of The Battle Of Borodino brings clattering military drums warming the original’s deep melancholy. For fans of The Knife, M83’s Saturdays=Youth, Junior Boys, The Chap, the decade begining in 1980."